For the kingdom in Hindu Epics, see Gandhara Kingdom. For other uses, see Gandhara (disambiguation). Gandhāra and other Mahajanapadas in the Post Vedic period. Gandhāra was an ancient state, a mahajanapada, in the Peshawar basin in the northwest portion of the ancient Indian subcontinent, present-day Afghanistan and Pakistan. The center of the region was at the confluence of the Kabul and Swat rivers, bounded by the Sulaiman Mountains on the west and the Indus River on the east. The Safed Koh mountains separated it from the Kohat region to the south. This being the core area of Gandhara, the cultural influence of "Greater Gandhara" extended across the Indus river to the Taxila region and westwards into the Kabul and Bamiyan valleys in Afghanistan, and northwards up to the Karakoram range. Gandhara was one of sixteen mahajanapadas (large conglomerations of urban and rural areas) of ancient India mentioned in Buddhist sources such as Anguttara Nikaya. During the Achaemenid period and Hellenistic period, its capital city was Pushkalavati (Greek: Πευκελαώτις), modern Charsadda. [note 1] Later the capital city was moved to Peshawar[note 2] by the Kushan emperor Kanishka the Great in about AD 127. Gandhara existed since the time of the Rigveda (c. 1500–1200 BC), as well as the Zoroastrian Avesta, which mentions it as Vaēkərəta, the sixth most beautiful place on earth, created by Ahura Mazda. Gandhara was conquered by the Achaemenid Empire in the 6th century BC. Conquered by Alexander the Great in 327 BC, it subsequently became part of the Maurya Empire and then the Indo-Greek Kingdom. The region was a major center for Greco-Buddhism under the Indo-Greeks and Gandharan Buddhism under later dynasties. It was also a central location for the spread of Buddhism to Central Asia and East Asia. It was also a center of Bactrian Zoroastrianism and Hinduism. Famed for its local tradition of Gandhara (Greco-Buddhist) Art, Gandhara attained its height from the 1st century to the 5th century under the Kushan Empire. Gandhara "flourished at the crossroads of Asia," connecting trade routes and absorbing cultural influences from diverse civilizations; Buddhism thrived until 8th or 9th centuries, when Islam first began to gain sway in the region. Pockets of Buddhism persisted in Pakistan's Swat valley until the 11th century. The Persian term Shahi is used by historian Al-Biruni to refer to the ruling dynasty that took over from the Kabul Shahi and ruled the region during the period prior to Muslim conquests of the 10th and 11th centuries. After it was conquered by Mahmud of Ghazni in 1001 AD, the name Gandhara disappeared. During the Muslim period, the area was administered from Lahore or from Kabul. During Mughal times, it was an independent district which included the Kabul province. Gandhara was known in Sanskrit as गन्धार gandhāra, in Avestan as Vaēkərəta, in Old Persian as Gadāra (Old Persian cuneiform: 𐎥𐎭𐎠𐎼, Gadāra, also transliterated as Gandāra since the nasal "n" before consonants was omitted in the Old Persian script, and simplified as Gandara) in Babylonian and Elamite as Paruparaesanna (Para-upari-sena), in Chinese as T: 犍陀羅/S: 犍陀罗 (Qiántuóluó), and in Greek as Γανδάρα (Gandhara). The Gandhari people are a tribe mentioned in the Rigveda, the Atharvaveda, and later Vedic texts. They are recorded in the Avestan-language of Zoroastrianism under the name Vaēkərəta. The name Gāndhāra occurs later in the classical Sanskrit of the epics. One proposed origin of the name is from the Sanskrit word गन्ध gandha, meaning "perfume" and "referring to the spices and aromatic herbs which they [the inhabitants] traded and with which they anointed themselves.". A Persian form of the name, Gandara, mentioned in the Behistun inscription of Emperor Darius I, was translated as Paruparaesanna (Para-upari-sena, meaning "beyond the Hindu Kush") in Babylonian and Elamite in the same inscription. In addition to Gandhara proper, the province also encompassed the Kabul Valley, Swat and Chitral. Kandahar is sometimes etymologically associated with Gandhara. However, Kandahar was not part of the main territory of Gandhara. The boundaries of Gandhara varied throughout history. Sometimes the Peshawar Valley and Taxila were collectively referred to as Gandhara; sometimes the Swat Valley (Sanskrit: Suvāstu) was also included. The heart of Gandhara, however, was always the Peshawar Valley. The kingdom was ruled from capitals at Kapisa (Bagram), Pushkalavati (Charsadda), Taxila, Puruṣapura (Peshawar) and in its final days from Udabhandapura (Hund) on the River Indus. Evidence of the Stone Age human inhabitants of Gandhara, including stone tools and burnt bones, was discovered at Sanghao near Mardan in area caves. The artifacts are approximately 15,000 years old. More recent excavations point to 30,000 years before the present. Gandhara was an ancient kingdom of the Peshawar Valley, extending between the Swat valley and Potohar plateau regions of Pakistan as well as the Jalalabad district of northeastern Afghanistan. In an archaeological context, the Vedic period in Gandhara corresponds to the Gandhara grave culture. The name of the Gandhāris is attested in the Rigveda (RV 1.126.7). The Gandhāris, along with the Balhikas (Bactrians), Mūjavants, Angas, and the Magadhas, are also mentioned in the Atharvaveda (AV 5.22.14), as distant people. Gandharas are included in the Uttarapatha division of Puranic and Buddhistic traditions. The Aitareya Brahmana refers to King Nagnajit of Gandhara who was a contemporary of Janaka, king of Videha. Kingdoms and cities of ancient India, with Gandhara located in the northwest of the Indian subcontinent, during the time of the Buddha (circa 500 BCE). Gandhara was one of sixteen mahajanapadas of ancient India. The primary cities of Gandhara were Puruṣapura (Peshawar), Takṣaśilā (Taxila), and Pushkalavati (Charsadda). The latter remained the capital of Gandhara down to the 2nd century AD, when the capital was moved to Peshawar. An important Buddhist shrine helped to make the city a centre of pilgrimage until the 7th century. Pushkalavati, in the Peshawar Valley, is situated at the confluence of the Swat and Kabul rivers, where three different branches of the River Kabul meet. That specific place is still called Prang (from Prayāga) and considered sacred; local people still bring their dead there for burial. Similar geographical characteristics are found at site of Prang in Kashmir and at the confluence of the Ganges and Yamuna, where the sacred city of Prayag is situated, west of Benares. There are some legends in which the two rivers are said to be joined here by the underground Sarasvati River, forming a triveṇī, a confluence of three rivers. However, Rigvedic texts, and modern research, suggest that the path of the Sarasvati River was very different. It ended in the ocean at Kachchh in modern Gujrat and not at Prayag. The Gandharan city of Taxila was an important Buddhist and Hindu centre of learning from the 5th century BC to the 2nd century. Gandhara is mentioned in the Hindu epics, the Mahabharata and the Ramayana, as a western kingdom. In Treta Yuga, before Lord Rama, during the reigns of Muchukunda, the kingdom of Gandhara was founded by the Druhyu prince Gandhara who was the son of King Angara of Druhyu Dynasty. During Ramayana time King Nagnajit(1) who was a contemporary of Lord Rama was defeated and killed by Rama's brother Bharata and Bharata's 1st son Taksha established Takshasila (Taxila) in Gandhara Kingdom on the banks of river Sindhu and Pushkara established Pushkaravati or Purushapura (Pushkar) in Gandharva tribe on the banks of river Saraswati after defeating and killing its king Sailusha who was the father-in-law of Vibhishana. In Dvapara Yuga, Gandhara prince Shakuni was the root of all the conspiracies of Duryodhana against the Pandavas, which finally resulted in the Kurukshetra War. Shakuni's sister was the wife of the Kuru king Dhritarashtra and was known as Gandhari. Gandhara was in modern Pakistan. Puskalavati, Takshasila (Taxila) and Purushapura (Peshawar) were cities in this Gandhara kingdom. Takshasila was founded by Raghava Rama's brother Bharata. Bharata's descendants ruled this kingdom afterwards. During epic period it was ruled by Shakuni's father Suvala, Shakuni and Shakuni's son. Arjuna defeated Shakuni's son during his post-war military campaign for Yudhishthira's Aswamedha Yagna. Eastern border of the Achaemenid Empire and ancient kingdoms and cities of India (circa 500 BCE). Athens coin (Circa 500/490-485 BCE) discovered in Pushkalavati. This coin is the earliest known example of its type to be found so far east. Such coins were circulating in the area as currency, at least as far as the Indus, during the reign of the Achaemenids. 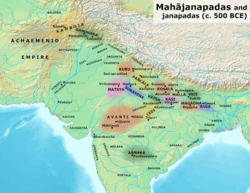 The main Vedic tribes remaining in the Indus Valley by 550 BC were the Kamboja, Sindhu, Taksas of Gandhara, the Madras and Kathas of the River Chenab, Mallas of the River Ravi and Tugras of the River Sutlej. These several tribes and principalities fought against one another to such an extent that the Indus Valley no longer had one powerful Vedic tribal kingdom to defend against outsiders and to wield the warring tribes into one organized kingdom. The area was wealthy and fertile, yet infighting led misery and despair. King Pushkarasakti of Gandhara was engaged in power struggles against his local rivals and as such the Khyber Pass remained poorly defended. King Darius I of the Achaemenid Empire took advantage of the opportunity and planned for an invasion. The Indus Valley was fabled in Persia for its gold and fertile soil and conquering it had been a major objective of his predecessor Cyrus The Great. In 542 BC, Cyrus had led his army and conquered the Makran coast in southern Balochistan. However, he is known to have campaigned beyond Makran (in the regions of Kalat, Khuzdar, Panjgur) and lost most of his army in the Gedrosian Desert (speculated today as the Kharan Desert). Xerxes I tomb, Gandharian soldier, circa 470 BCE. Xerxes I tomb, Gandharian soldier, circa 470 BCE (detail). Gandhara Kingdom/Takshila in Punjab was conquered by the Achaemenid empire in 518 BC. During this time, King Pushkarasakti, a contemporary of Emperor Bimbisara (558–491 BC) of the Magadha empire of Haryanka dynasty, was the king of Gandhara. King Pushkarasakti was engaged in power struggles against his local rivals. The Achaemenids under Darius penetrated to the region in 516 BC and annexed other parts of modern-day Punjab, Pakistan west to the Indus river and Sindh. The inscription on Darius' (521–486 BC) tomb at Naqsh-i-Rustam near Persepolis records Gadāra (Gandāra) along with Hindush (Hənduš, Sindh) in the list of satrapies. By about 380 BC the Persian hold on the region had weakened. Many small kingdoms sprang up in Gandhara. In 327 BC, Alexander the Great conquered Gandhara as well as the Indian satrapies of the Persian Empire. The expeditions of Alexander were recorded by his court historians and by Arrian (around AD 175) in his Anabasis Alexandri and by other chroniclers many centuries after the event. Sir Mortimer Wheeler conducted some excavations there in 1962, and identified various Achaemenid remains. "Victory coin" of Alexander the Great, minted in Babylon c. 322 BC, following his campaigns in the Indian subcontinent. Obverse: Alexander being crowned by Nike. 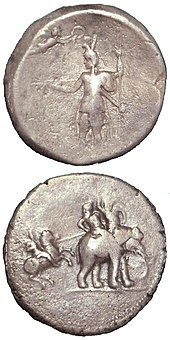 Reverse: Alexander attacking king Porus on his elephant. Silver. British Museum. In the winter of 327 BC, Alexander invited all the chieftains in the remaining five Achaemenid satraps to submit to his authority. Ambhi, then ruler of Taxila in the former Hindush satrapy complied, but the remaining tribes and clans in the former satraps of Gandhara, Arachosia, Sattagydia and Gedrosia rejected Alexander's offer. The first tribe they encountered were the Aspasioi tribe of the Kunar Valley, who initiated a fierce battle against Alexander, in which he himself was wounded in the shoulder by a dart. However, the Aspasioi eventually lost and 40,000 people were enslaved. Alexander then continued in a southwestern direction where he encountered the Assakenoi tribe of the Swat & Buner valleys in April 326 BC. The Assakenoi fought bravely and offered stubborn resistance to Alexander and his army in the cities of Ora, Bazira (Barikot) and Massaga. So enraged was Alexander about the resistance put up by the Assakenoi that he killed the entire population of Massaga and reduced its buildings to rubble. A similar slaughter then followed at Ora, another stronghold of the Assakenoi. The stories of these slaughters reached numerous Assakenians, who began fleeing to Aornos, a hill-fort located between Shangla and Kohistan. Alexander followed close behind their heels and besieged the strategic hill-fort, eventually capturing and destroying the fort and killing everyone inside. The remaining smaller tribes either surrendered or like the Astanenoi tribe of Pushkalavati (Charsadda) were quickly neutralized where 38,000 soldiers and 230,000 oxen were captured by Alexander. Eventually Alexander's smaller force would meet with the larger force which had come through the Khyber Pass met at Attock. With the conquest of Gandhara complete, Alexander switched to strengthening his military supply line, which by now stretched dangerously vulnerable over the Hindu Kush back to Balkh in Bactria. A monetary silver coin of the satrapy of Gandhara about 500–400 BC. Obv: Gandhara symbol representing 6 weapons with one point between two weapons; At the bottom of the point, a hollow moon. Rev: Empty. Dimensions: 14 mm Weight: 1.4 g.
Chandragupta Maurya, the founder of the Mauryan dynasty, is said to have lived in Taxila when Alexander captured the city. According to tradition, he trained under Kautilya, who remained his chief adviser throughout his reign. Supposedly using Gandhara and Vahika as his base, Chandragupta led a rebellion against the Magadha Empire and ascended the throne at Pataliputra in 321 BC. However, there are no contemporary Indian records of Chandragupta Maurya and almost all that is known is based on the diaries of Megasthenes, the ambassador of Seleucus at Pataliputra, as recorded by Arrian in his Indika. Ambhi hastened to relieve Alexander of his apprehension and met him with valuable presents, placing himself and all of his forces at his disposal. Alexander not only returned Ambhi his title, and the gifts, but he also presented him with a wardrobe of: "Persian robes, gold and silver ornaments, 30 horses and 1000 talents in gold". Alexander was emboldened to divide his forces, and Ambhi assisted Hephaestion and Perdiccas in constructing a bridge over the Indus where it bends at Hund (Fox 1973), supplied their troops with provisions, and received Alexander himself, and his whole army, in his capital city of Taxila, with every demonstration of friendship and the most liberal hospitality. On the subsequent advance of the Macedonian king, Taxiles accompanied him with a force of 5000 men and took part in the battle of the Hydaspes River. After that victory he was sent by Alexander in pursuit of Porus, to whom he was charged to offer favourable terms, but narrowly escaped losing his life at the hands of his old enemy. Subsequently, however, the two rivals were reconciled by the personal mediation of Alexander; and Taxiles, after having contributed zealously to the equipment of the fleet on the Hydaspes, was entrusted by the king with the government of the whole territory between that river and the Indus. A considerable accession of power was granted him after the death of Philip (son of Machatas); and he was allowed to retain his authority at the death of Alexander himself (323 BC), as well as in the subsequent partition of the provinces at Triparadisus, 321 BC. Later Ambhi was deposed and killed by Chandragupta Maurya, emperor of the Mauryan Empire. Gandhara was acquired from the Greeks by Chandragupta Maurya. After a battle with Seleucus Nicator (Alexander's successor in Asia) in 305 BC, the Mauryan Emperor extended his domain up to and including present Southern Afghanistan. With the completion of the Empire's Grand Trunk Road, the region prospered as a center of trade. Gandhara remained a part of the Mauryan Empire for about a century and a half. The decline of the Empire left the Indian subcontinent open to Greco-Bactrian invasions. Present-day southern Afghanistan was absorbed by Demetrius I of Bactria in 180 BC. Around about 185 BC, Demetrius invaded and conquered Gandhara and the Punjab. Later, wars between different groups of Bactrian Greeks resulted in the independence of Gandhara from Bactria and the formation of the Indo-Greek kingdom. Menander I was its most famous king. He ruled from Taxila and later from Sagala (Sialkot). He rebuilt Taxila (Sirkap) and Pushkalavati. He became a Buddhist and is remembered in Buddhist records for his discussions with the great Buddhist philosopher, Nāgasena, in the book Milinda Panha. Around the time of Menander's death in 140 BC, the Central Asian Kushans overran Bactria and ended Greek rule there. Around 80 BC, the Sakas, diverted by their Parthian cousins from Iran, moved into Gandhara and other parts of Pakistan and Western India. The most famous king of the Sakas, Maues, established himself in Gandhara. By 90 BC the Parthians had taken control of eastern Iran and, around 50 BC, they put an end to the last remnants of Greek rule in today's Afghanistan. Eventually an Indo-Parthian dynasty succeeded in taking control of Gandhara. The Parthians continued to support Greek artistic traditions. The start of the Gandharan Greco-Buddhist art is dated to about 75–50 BC. Links between Rome and the Indo-Parthian kingdoms existed. There is archaeological evidence that building techniques were transmitted between the two realms. Christian records claim that around AD 40 Thomas the Apostle visited the Indian subcontinent and encountered the Indo-Parthian king Gondophares. The Parthian dynasty fell about 75 to another group from Central Asia. The Kushans, known as Yuezhi in China (argued by some[who?] to be ethnically Asii) moved from Central Asia to Bactria, where they stayed for a century. Around 75, one of their tribes, the Kushan (Kuṣāṇa), under the leadership of Kujula Kadphises gained control of Gandhara and other parts of what is now Pakistan. The Kushan period is considered the Golden Period of Gandhara. Peshawar Valley and Taxila are littered with ruins of stupas and monasteries of this period. Gandharan art flourished and produced some of the best pieces of sculpture from the Indian subcontinent. Many monuments were created to commemorate the Jatakas. The Seated Buddha, dating from 300 to 500 CE, was found near Jamal Garhi, and is now on display at the Asian Art Museum in San Francisco. Gandhara's culture peaked during the reign of the great Kushan king Kanishka the Great (128–151). The cities of Taxila (Takṣaśilā) at Sirsukh and Peshawar were built. Peshawar became the capital of a great empire stretching from Gandhara to Central Asia. Kanishka was a great patron of the Buddhist faith; Buddhism spread to Central Asia and the Far East across Bactria and Sogdia, where his empire met the Han Empire of China. Buddhist art spread from Gandhara to other parts of Asia. Under Kanishka, Gandhara became a holy land of Buddhism and attracted Chinese pilgrims eager to view the monuments associated with many Jatakas. In Gandhara, Mahayana Buddhism flourished and Buddha was represented in human form. Under the Kushans new Buddhists stupas were built and old ones were enlarged. Huge statues of the Buddha were erected in monasteries and carved into the hillsides. Kanishka also built a great 400-foot tower at Peshawar. This tower was reported by Chinese monks Faxian, Song Yun, and Xuanzang who visited the country. This structure was destroyed and rebuilt many times until it was finally destroyed by Mahmud of Ghazni in the 11th century. The Hephthalite Huns captured Gandhara around 451, and did not adopt Buddhism, but in fact "perpetrated frightful massacres." Mihirakula became a "terrible persecutor" of the religion. During their rule, Hinduism revived itself and the Buddhist Gandharan civilization declined. The travel records of many Chinese Buddhist pilgrims record that Gandhara was going through a transformation during these centuries. Buddhism was declining, and Hinduism was rising. Faxian traveled around 400, when Prakrit was the language of the people, and Buddhism was flourishing. 100 years later, when Song Yun visited in 520, a different situation was described: the area had been destroyed by the White Huns and was ruled by Lae-Lih, who did not practice the laws of the Buddha. Xuanzang visited India around 644 and found Buddhism on the wane in Gandhara and Hinduism in the ascendant. Gandhara was ruled by a king from Kabul, who respected Buddha's law, but Taxila was in ruins, and Buddhist monasteries were deserted. Sharing of the Buddha's relics, above a Gandhara fortified city. After the fall of the Sassanid Empire to the Arabs in 644, today's Afghanistan region and Gandhara came under pressure from Muslims. But they failed to extend their empire to Gandhara. Gandhara was first ruled by local kings who later expanded their kingdom onto an empire. Gandhara was ruled from Kabul by Kabulshahi for next 200 years. Sometime in the 9th century the Kabul Shahi replaced the Shahi. Based on various Muslim records it is estimated this occurred in 870. According to Al-Biruni (973–1048), Kallar, a Brahmin minister of the Kabulshahi, founded the Shahi dynasty in 843. The dynasty ruled from Kabul, later moved their capital to Udabhandapura. They built great temples all over their kingdoms. Some of these buildings are still in good condition in the Salt Range of the Punjab. Jayapala was the last great king of this dynasty. His empire extended from west of Kabul to the river Sutlej. However, this expansion of Gandhara kingdom coincided with the rise of the powerful Ghaznavid Empire under Sabuktigin. Defeated twice by Sabuktigin and then by Mahmud of Ghazni in the Kabul valley, Jayapala gave his life on a funeral pyre. Anandapala, a son of Jayapala, moved his capital near Nandana in the Salt Range. In 1021 the last king of this dynasty, Trilochanapala, was assassinated by his own troops which spelled the end of Gandhara. Subsequently, some Shahi princes moved to Kashmir and became active in local politics. The city of Kandahar in Afghanistan is said to have been named after Gandhara. According to H.W. Bellow, an emigrant from Gandhara in the 5th century brought this name to modern Kandahar. Faxian reported that the Buddha's alms-bowl existed in Peshawar Valley when he visited around 400 (chapter XII). In 1872 Bellow saw this huge begging bowl (seven feet in diameter) preserved in the shrine of Sultan Wais outside Kandahar. When Olaf Caroe wrote his book in 1958 (Caroe, pp. 170–171), this relic was reported to be at Kabul Museum. The present status of this bowl is unknown. Now in the following times no Muslim conqueror passed beyond the frontier of Kâbul and the river Sindh until the days of the Turks, when they seized the power in Ghazna under the Sâmânî dynasty, and the supreme power fell to the lot of Nâṣir-addaula Sabuktagin. This prince chose the holy war as his calling, and therefore called himself al-Ghâzî ("the warrior/invader"). In the interest of his successors he constructed, in order to weaken the Indian frontier, those roads on which afterwards his son Yamin-addaula Maḥmûd marched into India during a period of thirty years and more. God be merciful to both father and son ! Maḥmûd utterly ruined the prosperity of the country, and performed there wonderful exploits, by which the Hindus became like atoms of dust scattered in all directions, and like a tale of old in the mouth of the people. Their scattered remains cherish, of course, the most inveterate aversion towards all Muslims. This is the reason, too, why Hindu sciences have retired far away from those parts of the country conquered by us, and have fled to places which our hand cannot yet reach, to Kashmir, Benares, and other places. And there the antagonism between them and all foreigners receives more and more nourishment both from political and religious sources. Fire and sword, havoc and destruction, marked his course everywhere. Gandhar which was styled the Garden of the North was left at his death a weird and desolate waste. Its rich fields and fruitful gardens, together with the canal which watered them (the course of which is still partially traceable in the western part of the plain), had all disappeared. Its numerous stone built cities, monasteries, and topes with their valuable and revered monuments and sculptures, were sacked, fired, razed to the ground, and utterly destroyed as habitations. Many stupas, such as the Shingerdar stupa in Ghalegay, are scattered throughout the region near Peshawar. By the time Gandhara had been absorbed into the empire of Mahmud of Ghazni, Buddhist buildings were already in ruins and Gandhara art had been forgotten. After Al-Biruni, the Kashmiri writer Kalhaṇa wrote his book Rajatarangini in 1151. He recorded some events that took place in Gandhara, and provided details about its last royal dynasty and capital Udabhandapura. In the 19th century, British soldiers and administrators started taking an interest in the ancient history of the Indian Subcontinent. In the 1830s coins of the post-Ashoka period were discovered, and in the same period Chinese travelogues were translated. Charles Masson, James Prinsep, and Alexander Cunningham deciphered the Kharosthi script in 1838. Chinese records provided locations and site plans for Buddhist shrines. Along with the discovery of coins, these records provided clues necessary to piece together the history of Gandhara. In 1848 Cunningham found Gandhara sculptures north of Peshawar. He also identified the site of Taxila in the 1860s. From then on a large number of Buddhist statues were discovered in the Peshawar valley. Archaeologist John Marshall excavated at Taxila between 1912 and 1934. He discovered separate Greek, Parthian, and Kushan cities and a large number of stupas and monasteries. These discoveries helped to piece together much more of the chronology of the history of Gandhara and its art. After 1947 Ahmed Hassan Dani and the Archaeology Department at the University of Peshawar made a number of discoveries in the Peshawar and Swat Valley. Excavation of many of the sites of Gandhara Civilization are being done by researchers from Peshawar and several universities around the world. Swat Valley in Pakistan has many Buddhist carvings, and stupas, and Jehanabad contains a Seated Buddha statue. Kushan era Buddhist stupas and statues in Swat valley were demolished after two attempts by the Taliban and the Jehanabad Buddha's face was dynamited. Only the Buddhas of Bamiyan were larger than the carved giant Buddha statues in Swat near Manglore which the Taliban attacked. The government did nothing to safeguard the statue after the initial attempts to destroy the Buddha, which did not cause permanent harm. But when a second attack took place on the statue, the feet, shoulders, and face were demolished. 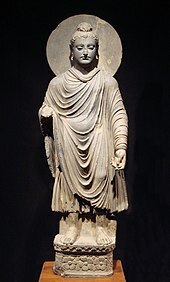 Islamists such as the Taliban, and looters, destroyed many of Pakistan's Buddhist artifacts from the Buddhist Gandhara civilization especially in the Swat Valley. The Taliban deliberately targeted Gandhara Buddhist relics for destruction. The Christian Archbishop of Lahore, Lawrence John Saldanha, wrote a letter to Pakistan's government denouncing the Taliban's activities in Swat Valley including their destruction of Buddha statues and their attacks on Christians, Sikhs, and Hindus. Gandhara Buddhist artifacts were illegally looted by smugglers. A group of Italians helped repair the Buddha. The Gandharan Buddhist texts are both the earliest Buddhist as well as Asian manuscripts discovered so far. Most are written on birch bark and were found in labelled clay pots. Panini has mentioned both the Vedic form of Sanskrit as well as what seems to be Gandhari, a later form of Sanskrit, in his Ashtadhyayi. Gandhara's language was a Prakrit or "Middle Indo-Aryan" dialect, usually called Gāndhārī. The language used the Kharosthi script, which died out about the 4th century. However, Punjabi, Hindko, and Kohistani, are derived from the Indo-Aryan Prakrits that were spoken in Gandhara and surrounding areas. 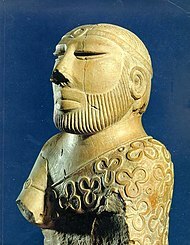 However, a language shift occurred as the ancient Gandharan culture gave way to Iranian invaders from Central Asia. Paul Harrison has worked on some of the texts that are arguably the earliest versions we have of the Mahāyāna sūtras, those translated into Chinese in the last half of the second century CE by the Indo-Scythian translator Lokakṣema. Harrison points to the enthusiasm in the Lokakṣema sūtra corpus for the extra ascetic practices, for dwelling in the forest, and above all for states of meditative absorption (samādhi). Meditation and meditative states seem to have occupied a central place in early Mahāyāna, certainly because of their spiritual efficacy but also because they may have given access to fresh revelations and inspiration. Some scholars believe that the Mahāyāna Longer Sukhāvatīvyūha Sūtra was compiled in the age of the Kushan Empire in the 1st and 2nd centuries AD, by an order of Mahīśāsaka bhikṣus which flourished in the Gandhāra region. However, it is likely that the longer Sukhāvatīvyūha owes greatly to the Mahāsāṃghika-Lokottaravāda sect as well for its compilation, and in this sūtra there are many elements in common with the Lokottaravādin Mahāvastu. There are also images of Amitābha Buddha with the bodhisattvas Avalokiteśvara and Mahāsthāmaprāpta which were made in Gandhāra during the Kushan era. 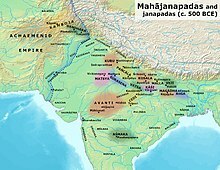 The Mañjuśrīmūlakalpa records that Kaniṣka of the Kushan Empire presided over the establishment of the Mahāyāna Prajñāpāramitā teachings in the northwest. Tāranātha wrote that in this region, 500 bodhisattvas attended the council at Jālandhra monastery during the time of Kaniṣka, suggesting some institutional strength for Mahāyāna in the northwest during this period. Edward Conze goes further to say that Prajñāpāramitā had great success in the northwest during the Kushan period, and may have been the "fortress and hearth" of early Mahāyāna, but not its origin, which he associates with the Mahāsāṃghika branch of Buddhism. A Sanskrit manuscript of the Bhaiṣajyaguruvaiḍūryaprabhārāja Sūtra was among the textual finds at Gilgit, Pakistan, attesting to the popularity of the Medicine Buddha in Gandhāra. The manuscripts in this find are dated before the 7th century, and are written in the upright Gupta script. Gandhāra is noted for the distinctive Gandhāra style of Buddhist art, which developed from a merger of Greek, Syrian, Persian, and local artistic influences. This development began during the Parthian Period (50 BC – AD 75). The Gandhāran style flourished and achieved its peak during the Kushan period, from the 1st to the 5th centuries. It declined and was destroyed after the invasion of the White Huns in the 5th century. Stucco as well as stone was widely used by sculptors in Gandhara for the decoration of monastic and cult buildings. Stucco provided the artist with a medium of great plasticity, enabling a high degree of expressiveness to be given to the sculpture. Sculpting in stucco was popular wherever Buddhism spread from Gandhara – Afghanistan, Pakistan, India, Central Asia, and China. c. 1900 – c. 520 BC No written records. Indo-Aryan migrations. Ramayana legend says Lord Rama's brother Bharat ruled from Gandhara. c. 1200 – c. 800 BC Gandhari people mentioned in Rigveda and Atharvaveda. c. 520 – c. 326 BC Persian Empire. Under direct Persian control and/or local control under Achaemenid suzerainty. c. 7 – c. 75 Parthian invasion and Indo-Parthian Kingdom, Rule of Commander Aspavarman?. Ambhi Kumar, king of Gandhara was a descendant of Lord Raghu and prince Bharat of Kosala Kingdom. c. 1032 – 1350 Conquered and controlled by the empire of Mahmud of Ghazni. ^ Sanskrit Puruṣapura, literally meaning "city of men", from puruṣa, "(primordial) man" and pura, "city". ^ NOTE: See long discussion under mahajanapada from the Ancient Buddhist text Anguttara Nikaya's list of mahajanapadas. ^ Neelis, Early Buddhist Transmission and Trade Networks 2010, p. 232. ^ Eggermont, Alexander's Campaigns in Sind and Baluchistan 1975, pp. 175–177. ^ a b Khoinaijam Rita Devi (1 January 2007). History of ancient India: on the basis of Buddhist literature. Akansha Publishing House. ISBN 978-81-8370-086-3. ^ a b "Rigveda 1.126:7, English translation by Ralph TH Griffith". ^ Arthur Anthony Macdonell (1997). A History of Sanskrit Literature. Motilal Banarsidass. pp. 130–. ISBN 978-81-208-0095-3. ^ Mohiuddin, Yasmeen Niaz (2007). Pakistan: A Global Studies Handbook. ABC-CLIO. ISBN 9781851098019. ^ a b Perfrancesco Callieri, INDIA ii. Historical Geography, Encyclopaedia Iranica, 15 December 2004. ^ Macdonell, Arthur Anthony; Keith, Arthur Berriedale (1995). Vedic Index of Names and Subjects. 1. Motilal Banarsidass Publishers. p. 219. At Google Books. ^ Thomas Watters (1904). "On Yuan Chwang's travels in India, 629–645 A.D." Royal Asiatic Society. p. 200. Taken as Gandhavat the name is explained as meaning hsiang-hsing or "scent-action" from the word gandha which means scent, small, perfume. At the Internet Archive. ^ Adrian Room (1997). Placenames of the World. McFarland. Kandahar. City, south central Afghanistan At Google Books. ^ Herodotus (1920). "3.102.1". Histories. "4.44.2". Histories (in Greek). With an English translation by A. D. Godley. CS1 maint: others (link) "3.102.1". Histories. "4.44.2". Histories. Cambridge: Harvard University Press. At the Perseus Project. ^ Bopearachchi, Osmund. "Coin Production and Circulation in Central Asia and North-West India (Before and after Alexander’s Conquest)". pp. 300–301. ^ Bopearachchi, Osmund. "Coin Production and Circulation in Central Asia and North-West India (Before and after Alexander’s Conquest)". pp. 308-. ^ Marshall, John (1975) . Taxila: Volume I. Delhi: Motilal Banarsidass. pp. 83. ^ Revue des etudes grecques 1973, p 131, Ch-Em Ruelle, Association pour l'encouragement des etudes grecques en France. ^ Early Indian Economic History, 1973, pp 237, 324, Rajaram Narayan Saletore. ^ Myths of the Dog-man, 199, p 119, David Gordon White; Journal of the Oriental Institute, 1919, p 200; Journal of Indian Museums, 1973, p 2, Museums Association of India; The Pāradas: A Study in Their Coinage and History, 1972, p 52, Dr B. N. Mukherjee – Pāradas; Journal of the Department of Sanskrit, 1989, p 50, Rabindra Bharati University, Dept. of Sanskrit- Sanskrit literature; The Journal of Academy of Indian Numismatics & Sigillography, 1988, p 58, Academy of Indian Numismatics and Sigillography – Numismatics; Cf: Rivers of Life: Or Sources and Streams of the Faiths of Man in All Lands, 2002, p 114, J. G. R. Forlong. ^ Journal of the Oriental Institute, 1919, p 265, Oriental Institute (Vadodara, India) – Oriental studies; For Kuru-Kamboja connections, see Dr Chandra Chakraberty's views in: Literary history of ancient India in relation to its racial and linguistic affiliations, pp 14,37, Vedas; The Racial History of India, 1944, p 153, Chandra Chakraberty – Ethnology; Paradise of Gods, 1966, p 330, Qamarud Din Ahmed – Pakistan. ^ Ancient India, History of India for 1000 years, four Volumes, Vol I, 1938, pp 38, 98 Dr T. L. Shah. ^ Grousset, Rene (1970). The Empire of the Steppes. Rutgers University Press. pp. 69–71. ISBN 0-8135-1304-9. ^ Alberuni's India. (c. 1030 AD). Translated and annotated by Edward C. Sachau in two volumes. Kegana Paul, Trench, Trübner, London. (1910). Vol. I, p. 22. ^ a b Henry Walter Bellow. The races of Afghanistan Being a brief account of the principal nations inhabiting that country. Asian Educational services. p. 73. ^ Malala Yousafzai (8 October 2013). I Am Malala: The Girl Who Stood Up for Education and Was Shot by the Taliban. Little, Brown. pp. 123–124. ISBN 978-0-316-32241-6. ^ Wijewardena, W.A. (17 February 2014). "'I am Malala': But then, we all are Malalas, aren't we?". Daily FT.
^ Wijewardena, W.A (17 February 2014). "'I am Malala': But Then, We All Are Malalas, Aren't We?". Colombo Telegraph. ^ "Attack on giant Pakistan Buddha". BBC NEWS. 12 September 2007. ^ "Another attack on the giant Buddha of Swat". AsiaNews.it. 10 November 2007. ^ "Taliban and traffickers destroying Pakistan's Buddhist heritage". AsiaNews.it. 22 October 2012. ^ "Taliban trying to destroy Buddhist art from the Gandhara period". AsiaNews.it. 27 November 2009. ^ Felix, Qaiser (21 April 2009). "Archbishop of Lahore: Sharia in the Swat Valley is contrary to Pakistan's founding principles". AsiaNews.it. ^ Rizvi, Jaffer (6 July 2012). "Pakistan police foil huge artefact smuggling attempt". BBC News. ^ Khaliq, Fazal (7 November 2016). "Iconic Buddha in Swat valley restored after nine years when Taliban defaced it". DAWN. ^ "Khaljies are Afghan". Abdul Hai Habibi. alamahabibi.com. Retrieved 19 August 2012. ^ "Gandharan Sculptural Style: The Buddha Image". Archived from the original on 18 December 2014. Retrieved 7 February 2016. ^ a b "Schøyen Collection: Buddhism". Retrieved 23 June 2012. Caroe, Sir Olaf, The Pathans, Oxford University Press, Karachi, 1958. Herodotus (1920). Histories (in Greek and English). With an English translation by A. D. Godley. Cambridge: Harvard University Press. Hill, John E. 2003. "Annotated Translation of the Chapter on the Western Regions according to the Hou Hanshu". 2nd Edition: Through the Jade Gate to Rome: A Study of the Silk Routes, 1st to 2nd Centuries CE. 2015. John E. Hill. Volume I, ISBN 978-1500696702; Volume II, ISBN 978-1503384620. CreateSpace, North Charleston, S.C.
Hussain, J. An Illustrated History of Pakistan, Oxford University Press, Karachi, 1983. Legge, James. Trans. and ed. 1886. A Record of Buddhistic Kingdoms: being an account by the Chinese monk Fâ-hsien of his travels in India and Ceylon (A.D. 399–414) in search of the Buddhist Books of Discipline. Reprint: Dover Publications, New York. 1965. Watters, Thomas. 1904–5. On Yuan Chwang's Travels in India (A.D. 629–645). Reprint: Mushiram Manoharlal Publishers, New Delhi. 1973. Wikimedia Commons has media related to Gandhara. This page was last edited on 26 February 2019, at 15:05 (UTC).